One of the first Asian Masters of Horror, Japanese director Nobuo Nakagawa offered up numerous exceptional horror films in the late 1950s and early 60s with scores of important and legendary titles. 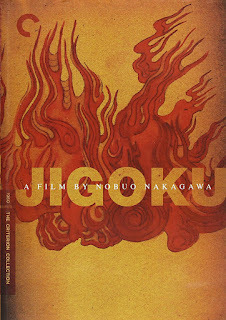 After several tales offering variations of ghost tales, Nakagawa decided to go for a more existential tale of remorse and greed which scored him one of the biggest hits of his career and secured his reputation with a vengeance leading to who he is today. Trying to move on in life, Shiro Shimizu (Shigeru Amachi, from “The Tale of Zatoichi”) finds that his involvement with Tamura (Yoichi Numata, from “Ringu”) taints his relationship with his fiancée Yukiko Yajima (Utako Mitsuya, from “Attack from Space”) as his disdainful attitude really sours her. When they both get involved in a car accident that takes its victim, they again feel differently about reporting their involvement in the incident, and soon afterward, a series of personal tragedies effects him. As they both take the news normally, he starts to feel the pressure of the situation getting to him before lashing out at everyone, including Sachiko (Utako Mitsuya in a dual role) an old friend. When their behavior finally catches up to them, they find the eternal bowels of Hell are awaiting them for their punishments of the sins they committed in life. There was some really great stuff in this one. One of the better features with this one is the incredibly impressive and enjoyable visual prowess demonstrated. “Jigoku” is a highly visual film, with a large amount of time spent simply on creating wonderful images for inconsequential moments. The encounter on the bridge, the weirdness of the caricatures in the opening montage to their idea of Hell, where shots feature select objects sitting in the middle of the picture with a black frame around everything else that all make for an enjoyable series of scenes. This makes the film incredibly engaging by offering visually engaging work throughout here. 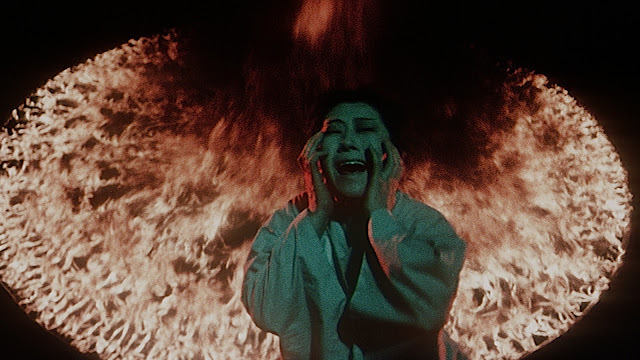 Even the non-horror work is in this manner, as cinematographer Mamoru Morita creates some impressive work in the crash that sets the film in motion, the scenes of lonely Shiro wandering through the countryside or the fine scenes in the village where he meets up with the family of the one he killed. When it gets to the final act, it becomes far more prevalent as it’s literally in the afterworld and is just a continuous stream of incredible images. From the interactions with the God of the Underworld to the scenes with them by the river and the conclusion where Shiro climbs along the cogs of a giant machine to rescue the spirit of his unborn child, this is one of the most exciting and action-packed scenes in the film. The ingenuity and creativity to think of such scenes and concepts that are depicted go a long way towards providing this part of the film with its power. To be able to place the forms of torture imagined here is truly impressive as well as terrifying. The various demons look imposing, the different activities forced upon everyone are cruel and brutal while the extended length allows for the time to let them play out to their conclusive end. Being the first film to actually utilize gore, the tortures become that much more chilling and personal with all the people that are tormented. As they form a certain element of weirdness for the best parts of the film, they combine to make it so watchable on their own. Also rather enjoyable is the moral quandaries it offers. The film manages to become really entertaining in it’s middle half involving whether or not their actions are in keeping with the traditions. It pretty much develops into a series of ethical and moral questions about what they’re doing that are going against their philosophical teachings. The way they’re presented here with the situation constantly getting worse makes for some really interesting moments which allow the film a rather nice continuation which brings the tortures to the fold for the remaining parts of the film. It digs into Shiro’s psyche by constantly flashing back to the accident as his mother gets worse, and once the victim’s mother gets involved he becomes even more fragile. Comparing it against his happiness with his impending marriage adds another layer as for why Shiro wants to break his silence and why Tamura is so set against the secret coming out. While the acting isn’t the greatest, the actors do a competent job with their characters. Shigeru Amachi as Shiro Shimizu comes back to Nakagawa’s employ following his lead turn in “Tokaido Yotsuya Kaidan,” and while not as powerful here he still comes off nicely. The inner turmoil is nicely conveyed and the hysterics of what’s happening to those around him give this a strong character. It gets even better in the Hell sequences as his anguish over getting to his child is powerfully conveyed, and these make for a strong central figure. His friend Tamura, played by Yoichi Numata, steals the show easily here. His utter remorseless attitude and uncaring disposition around Shiro create a creepy, slimy villain and Numata sinks into the role. It does bring up the issue of why they’re friends because the two are so different, but it’s not a distracting issue. Utako Mitsuya turns in a dual role as Sachiko and Yukiko even though neither are really memorable. Yukiko is the typical demure, passive woman from the time who is bossed around by men and isn’t allowed to voice her opinions. Sachiko is a little more memorable as she has more to do with the hospital in the countryside, yet the tender side of Yukiko comes back in the Hell scenes which adds to those scenes. There really wasn’t a whole lot of flaws to this one. One of the only problems here is the fact that, during the middle segment, it noticeably stops being a horror film and instead turns into a character study about the effect their actions have on them. This isn’t incredibly exciting when it comes to being about a horror film. The film has a series of scenes where nothing but drama inflicts the film and doesn’t really do much. It really needs to be streamed down and have less intrusion with how much time is taken up by all the drama taking place. The scenes at the clinic and the first two conversations with the family are the prime examples of this, as they not only stretch the film out but really seem out-of-place in where they come from. It’s the most damaging thing about the film, and really serves as it’s only real flaw. Overall, this is one of the most visually-intriguing and enjoyable entries in the genre. Those who prefer the Japanese films of this era with undoubtedly enjoy this one, as will those who place importance on technical competence, while the ones who aren’t into that should heed caution.